This innovative vehicle is a great way for children to get exercise indoors or outdoors. It does not require gears or pedals. Turn the steering wheel from side to side and away you go. Flip the wheel 180 degrees to steer backwards. 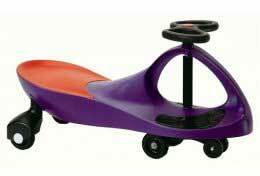 PlasmaCar harnesses inertia, centrifugal force, and friction to propel children to fun. The smoother the driving surface, the faster you go. To stop, cease rotating the steering wheel and put your feet onto the ground. Vehicles come in four colors: red, purple, green and blue.